In a send-off both grand and personal, a celebrity lineup of mourners filled the same Detroit church that hosted Rosa Parks’ funeral and offered prayers, songs and dozens of tributes. Guests included former President Bill Clinton, former first lady Hillary Clinton, the Rev. Jesse Jackson, Stevie Wonder and Smokey Robinson. In this video, Rev. 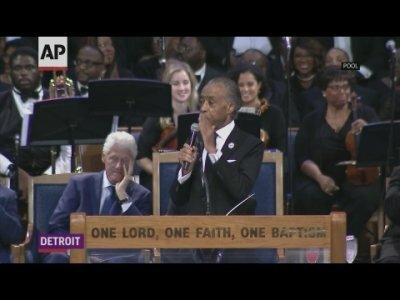 Al Sharpton calls Aretha Franklin 'soundtrack of civil rights movement' and asks guests to help 'correct' President Trump and teach him what respect means. The epic funeral unfolded on the same day as services for Arizona Sen. John McCain in the nation’s capital, creating a challenge for some news networks trying to show both ceremonies. The McCain memorial, with its reverential silence and ramrod-straight honor guard, contrasted sharply with the joyous remembrance in Detroit. Her career, Clinton noted, spanned from vinyl records to cellphones. He held the microphone near his iPhone and played a snippet of Franklin’s classic “Think,” the audience clapping along. Lasting just over eight hours, the service at Greater Grace Temple encompassed many of the same elements and emotions that were hallmarks of Franklin’s more than six decades on sacred and secular stages. She was remembered as the pride of Detroit and a citizen of the world. Actress Cicely Tyson reworked the Paul Laurence Dunbar poem “When Malindy Sings” to “When Aretha Sings.” Music mogul Clive Davis, who helped revive Franklin’s career in the 1980s, described her as a loving friend and a dedicated and unpredictable artist, whose passions ranged from soul to ballet. He remembered her turning up at a tribute to him in a tutu. In this video, Ariana Grande performs ‘(You Make Me Feel Like) A Natural Woman’ and Faith Hill sings "What a Friend We Have in Jesus." Gladys Knight segued from “You’ll Never Walk Alone” to “Bridge Over Troubled Water.” Near the end, Stevie Wonder brought the dwindling audience to their feet, swaying to his classic tribute to love, “As.” Jennifer Holliday ended the funeral with “Climbing Higher Mountains,” an uptempo gospel original by Franklin herself.